Maine is an ideal place for your festive spirit. 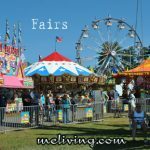 Maine County, State and Agricultural Fairs are a favorite pastime – visit Maine and join the celebration! Maine agricultural fairs offer affordable, educational family entertainment. A visit to a Maine Fair is a great way to experience Maine. Maine Fair season begins in early July and runs through early October. Ask us about Maine Fairs or share comments. To feature your Maine business, contact us.